Dynes, kiloponds, pounds force and all those strange units - what are they? With our force converter you can quickly change between different units of force. Whether you're looking for the conversion from newton to dynes, newtons to pounds-force, kilopond to newton or any other conversion between popular units, this tool is a safe bet. 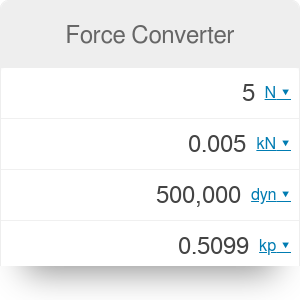 Keep scrolling to find the formulas behind the force conversions and to read about the newton unit definition or origins of different force units. a is the acceleration of the object. To have a grasp of that unit and understand how much is one newton, let's have a look at the examples. But first of all, we need to explain that mass and weight concepts are meaning something different in common usage and physics world. In everyday life, we use the weight term to express the concept of the quantity - amount of "matter" in an object, and we express it in e.g. kilograms or pounds. However, physicists will call that quantity mass, and the weight word is reserved for the amount of force acting on the object, either due to gravity or to a reaction force that holds it in place. The weight is then expressed in force units - newtons. Looks complicated, huh? Have a look at our explanatory table and all should be clear! One newton is the force equal to the weight of an average apple with a mass of 102 g.
An object with a mass of one kilogram e.g. 1 kg of sugar will weigh ~9.81 newtons on the surface of the Earth. Again, in Earth normal gravity, 1 kN = 102 kg = 225 lbs. 1-ton car will weight 10 kN on the Earth surface. To sum up - if we're talking about the objects on the Earth surface, all we need to do is to divide the weight in newtons by 9.81 (or 10 if we only need a rough estimation) to obtain the mass in kilograms. However, if we want to know what's the weight on other planets, we need to take into account the gravitational forces on each of the planets. So the mass will remain the same, but the weight of the object will differ. If you're curious what's your weight on other planets (in comparison to your weight on the Earth, as we now understand that mass is constant) check out our great calculator. Though newton unit is the basic unit from SI system, others units also exist (and that's why we need this force converter). What are these units' origins and where they are used? Dynes are the units from the predecessor of SI system - CGS system of units. They're rarely used nowadays, but you can find them in old physics books. The dyne per centimeter is a unit which is still used in surface tension measurements. as a standard unit for Vickers hardness testing. Pound-force is defined as the gravitational force exerted on a mass of one avoirdupois pound on the surface of Earth. It's used in systems such as English Engineering units and the British Gravitational System. One poundal is equal to the force necessary to accelerate one pound-mass at one foot per second. A poundal is a unit from foot–pound–second system (FPS) and it's still in occasional use. Kips are US customary unit of force. The name comes from combining the words kilo and pound. It may be confusing, but kips are sometimes considered as a unit of weight, not force, e.g. for expression of the deadweight to compute shipping charges. Force Converter can be embedded on your website to enrich the content you wrote and make it easier for your visitors to understand your message.